Grilled sweet corn and zucchini panzanella salad: With its fresh herb vinaigrette, this grilled salad is the ultimate tribute to summer’s best foods. If there’s anything I look forward to all year long, it’s the abundance of fresh summer produce. Except for one or two years that I can remember, my parents didn’t have a vegetable garden but I have vivid memories of making the rounds – windows down, hot and humid summer air blowing in – to local farm stands with my mom each August to seek out the best tomatoes and sweet corn in the area. I can still give you directions to no less that seven different farm stands we frequented each summer, even after all these years! 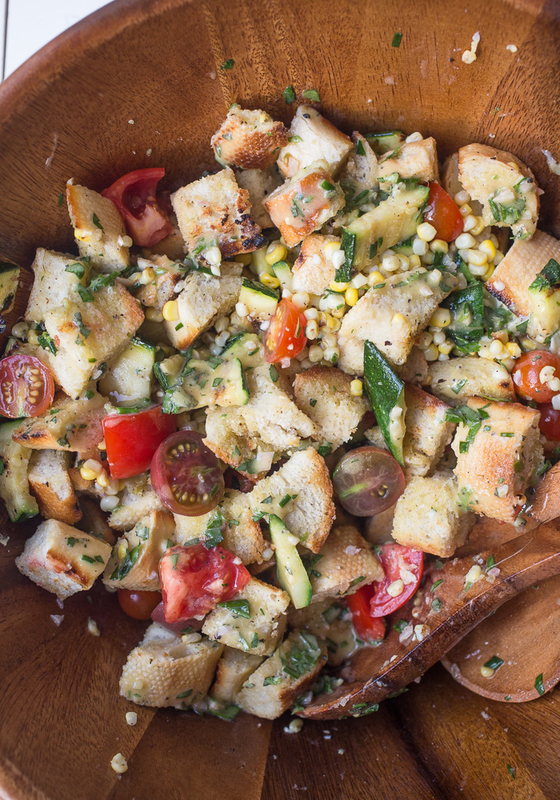 This grilled sweet corn and zucchini panzanella salad is the ultimate tribute to summer’s best foods and with the fresh herb vinaigrette I added to the mix, I dare you to turn this down. 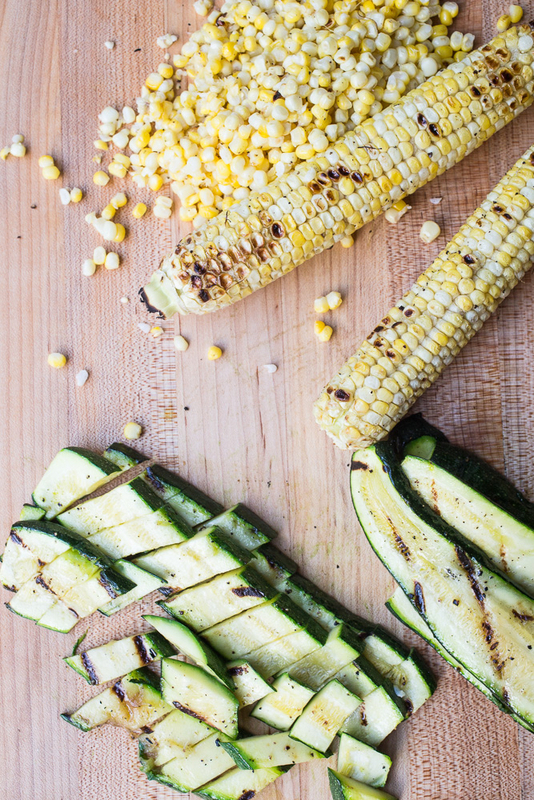 The corn, zucchini, and French baguette are all drizzled with olive oil, sprinkled with salt and pepper, and then grilled to lightly charred perfection so there’s no need for the oven or stove. Let’s just add this one to my light meals for hot nights list! I tossed a bunch of cherry tomatoes from our garden in before mixing everything up with the herb vinaigrette and then we both devoured dinner. Even after we’ve eaten this meal twice in the past two weeks, you can bet it’s not going anywhere until local corn has vanished from the farm stands and markets. That won’t be a moment too soon! And to sweeten the deal with this grilled sweet corn and zucchini panzanella salad, I’m also giving you the chance to win one of these gorgeous cutting boards from CuttingBoard.com! As you know, cutting boards are used for everything from chopping & dicing ingredients, while preparing a dish, to allowing meat to rest and then be sliced and served…to gorgeous vehicles to set out your party food and for endless amounts of blog photos (ahem…). 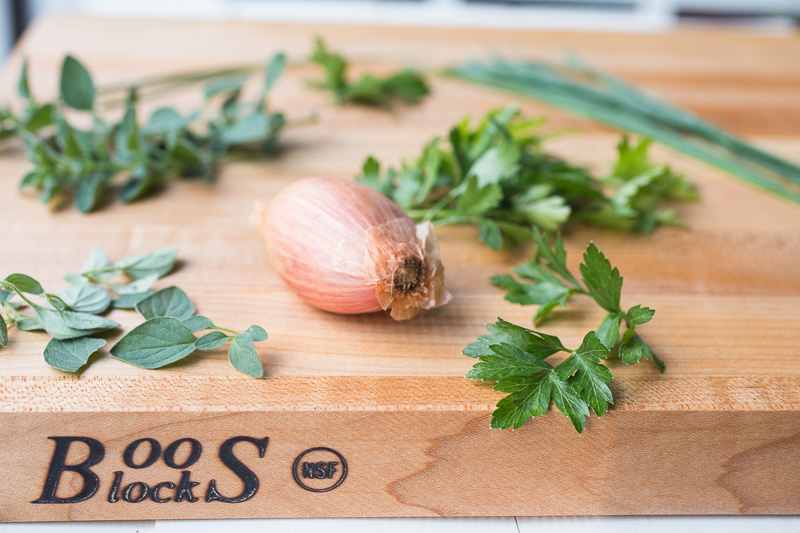 Now, I have been coveting a John Boos cutting board for years and I was lucky enough work with one of the John Boos boards they carry for this post. This hardwood maple board just blew me away. In the past couple of months, I have been sharpening my go-to knife way more than I would like and I have been wondering if I need to get my knives professionally sharpened. Nope, it’s the cutting boards I have been using that are preventing a nice smooth chop. My knife tore through the veggies and herbs for this salad on the Boos board like it was brand new – talk about blowing me away! Aside from carrying a wide variety of fantastic quality boards, CuttingBoard.com is proud to source products that are certified sustainable, renewable or reclaimed, making them unique from other physical and online stores. They believe in a commitment to quality and environmental stewardship, so all of the products in their store adhere to these principles. They are also a member of 1% For the Planet and donate a portion of each sale to charity toward environmental causes. As a genuine small business, CuttingBoard.com takes pride in ensuring that their customers are always happy when shopping with them. These are things I can get behind. 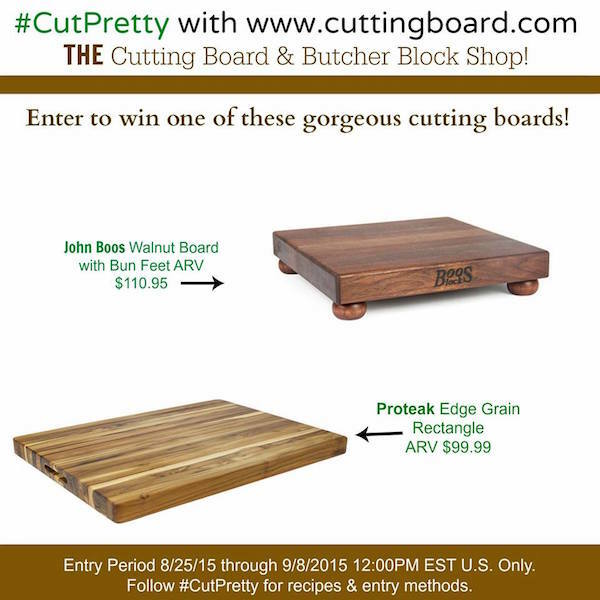 Two winners will be chosen at random to win one of the two cutting boards in the photo above. Enter between 8/25/15 and 9/8/15 by using the Rafflecopter link below. If you are looking for recipe & entertaining inspiration and would also like to see the cutting boards that inspired them, plus earn additional entries for the giveaway, check out the recipes for Pulled Pork Pizza, BBQ Chicken Puffs, Ancho Smoked Pork, Easy Macaroni Salad, Chipotle Chili Fish Tacos With Peach Pineapple Salsa, Maple Bacon Bread, Chicken Cordon Blue Pizza, Casual Entertaining / Cheese Board, and Buffalo Chicken Salad with Spicy Ranch Dressing. Many thanks to CuttingBoard.com for sponsoring this giveaway! 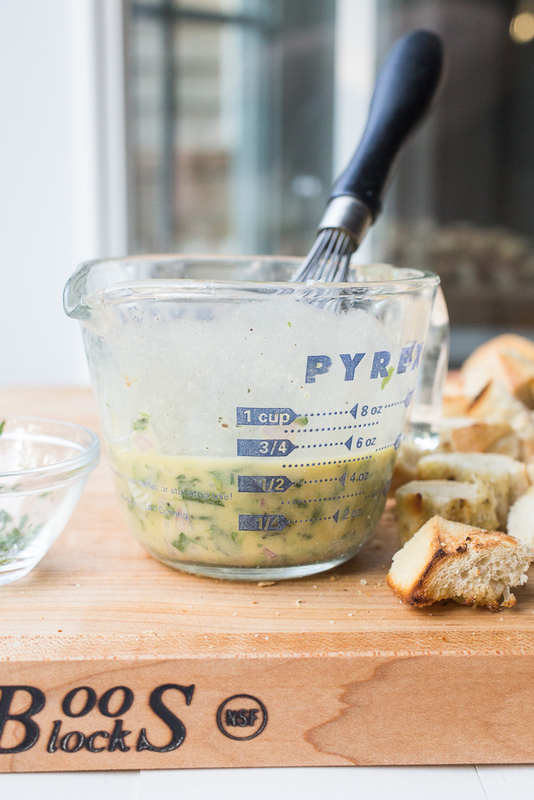 Whisk the vinegar, shallot, mayonnaise, mustard, salt, and pepper together in a 2 cup glass measuring cup; set aside. Chop all of the herbs and set aside. Drizzle the corn, zucchini, and cut side of the bread with olive oil and sprinkle with salt and pepper. Grill the corn for about 10 minutes, turning every few minutes to prevent burning; the zucchini for 2-3 minutes per side; and the bread until both sides are nicely toasted, about 4 minutes total. Cut the corn off the cob, slice the zucchini into 1-inch pieces, and cut the bread into 1-inch pieces. Toss the corn, zucchini, bread, and tomatoes in a large salad bowl. In a thin steady stream, quickly whisk the oil into the dressing ingredients until the mixture has thickened. Stir in the herbs. Toss the dressing with the salad ingredients and serve immediately. Yum – what a great way to showcase fresh sweet corn and zucchini! Thanks! We’ve eaten so much corn and zucchini this summer – I never want them to leave. Thanks for the great vinaigrette recipe – I’m sure it would go well with couscous and roasted veggies too! And that footed board is adorbs!! Absolutely! I’ve got a roasted veggie orzo salad on the blog from last summer that would take this vinaigrette on like a champ. The cutting boards are gorgeous! Isn’t it an outstanding board?! I’ve already used it countless times since receiving it! These cutting boards are cool! Love the grilled corn, looks tasty! Love those cutting boards! No matter how many different ones I try, wood cutting boards just always feel so much better when cutting on them! Boos cutting boards are the best! Never can have too many cutting boards and these are gorgeous!